In a previous post, I talk about a new amp project. Since this post, I bought several stuffs to build it. But while looking for parts, I talk with several people. And they convince me to build a push-pull instead of a single-end. So, I got 4 outputs transformers (2 SE and 2 PP), I gonna try the PP first, and if this work great perhaps, I will sell the single transformers or build a second amp. The main difference between single-end and push-pull, is distortion. In fact, SE produce a lot of harmonics, so a lot of distortion. Beside this is a bad idea for a power amp, this is really what a lot of people call a “real tube sound”. Anyways let’s start with a full featured push-pull, and perhaps came back to a simple SE just for the fun. The main issue right now, is that push-pull are a lot of more complicated. I mean you can build a simple SE with only a spare components.. this is not the case of a push-pull. For a single channel, I need 2 tubes, 1 bias power-supply, a highly regulated power supply and a phase shifter ..
For the tubes, I decided to use some KT88. In fact, a friend give me a spare matched quad of NOS (plain old) Gold Lion tubes + the needed output transformers so .. This tube are really great for the HIFI. And they look really great !!! This entry was posted in Hifi and tagged 6sn7, amp, audio, kt88, tube by admin. Bookmark the permalink. Nice electronics page. I’m also looking into building my first tube amp and have been looking for a good schematics. Could you kindly provide a link to the webpage that have this schematic? This is by far the best-looking schematics I’ve seen. Thanks!! ps. if you could, please reply to my email @ paul.p.pan@gmail.com. Thanks again. Perhaps you should look for a simpler bias system to safe cash and simplify things. 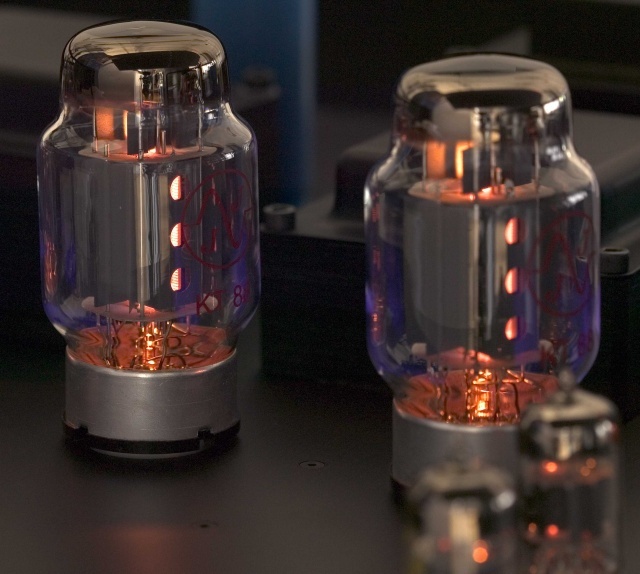 Cathode bias = No bias adjustment when you swap tubes! I recommend a fender deluxe 5Y3 circuit with cathode bias, there is no fixed voltage supply to the grids, the cathodes are grounded. Substitute rectifier tube with silicon diodes, or switchable recto. Tube rectifier in double-end amp = power supply sag = sustain. Very loud for a hobby amp. I’ve built a few SE amps from scratch, but would recommend using an old chassis from a 50′s radio as a good starter project as well. I am planning an amp in an old mono radio phono unit, SE with all transformers in place, $25 at the auction. It will be the amp/record playing computer desk! anyways, good luck and merci pour l’anglais. I have built the same amp excluding the second tube. I am using plitron power transformer along with Hammond power out put transformer.No hum the sound is ok little low on power. I will check it at 1khs and 1.5 volt input signal. On a fixed load of 8 ohms. The tube compliment is two 6550 per side and one 12au7 as a driver. There is no feed back applied.A simple switch can be applied to convert this to a triode or ultra linear.Expensive project will last for a long time.Svetlana tubes and solen caps. 6550′s and custome toroidal transformers or making the transformers my self. 1.Did you ever got around building this project? 2. I understand that this design is based on Plitron special transformers. Specifically, the output transformer is not using all secondary connections. However the Hammond transforms require that all secondary links to be used (according to data sheet). did you look into it? 3. did you consider adding voltage regulation to the power supply part? 1) Nop, not started yet .. i’m really to busy. 3) I’m considering adding voltage regulation for the first stages .. yes. For the KT88 this isn’t do-able .. but for the rest, this can be done easily I think. Great design for KT88 push-pull. I got a Single-ended output transformer. Got sugestions or site for parallel KT88 single ended amplifier? Nice schematic, it will be fine i think. What about the power supply schematic? I would like to know if any one has the power supply schematic. At present . I have used a plitron transformer.. I recently made a line preamp and I also incorporated a timer with relays to control the out put after 60 seconds to prevent a thump at the speakers. preamp parts cost around $ 10 Canadian this is excluding the power supply. All toll the cost was around $150 including the enclosure.